BADFA | Kim - splash it! Convention 17 – the pace is hotting up! As the date gets closer, so the pace quickens. So much to fit in! The badges are finished – but the design remains secret until the big day. 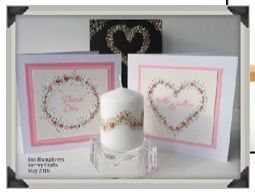 It is hand painted and should please the FolkIt fans, and the traditional Folk Art painters. The bits and pieces for Friday Night Fun have been ordered, and are in the post – under plain wrapper. Something else that will be a surprise on the night. I’ve prepared my class for Saturday, and there will be some extra flourishes for my students – a little added value. I’ve rounded up the paints, table coverings, and a box full of random items we needed last year – I guess we’ll need them again – and the mdf blanks will need to be arranged to fit in the car, too. Supplies from our sponsors, DecoArt, of their Media Range, have arrived, and traders are booked to fill the tables with good, must-have stuff. This year we have a new trader bringing brushes at special prices. The big rush now is to get the last newsletter out to members before I go on holiday. Luckily the team proof read before we go live, otherwise there’s no telling what gobbledegook I’d be sending. Then all that will remain is for Julie and I to catch the plane to Cyprus, and enjoy a week in the sun (we hope). Oi! You at the back! Get in line! It’s been a busy day at chez Kim. Apart from getting motorbikes serviced and tidying the garden, I’ve put my brushes to good use on some preparation for BADFA’s forthcoming convention. See previous post for details. One of the convention’s conventions is to present each attendee with a badge for the occasion. Of course the badges have to be hand painted, what else! And this year it falls to me to do them. I also did 2014 and 2016. Anyway, here are this years badges in progress. Look at that! There is always one little rebel who has to be out of step! 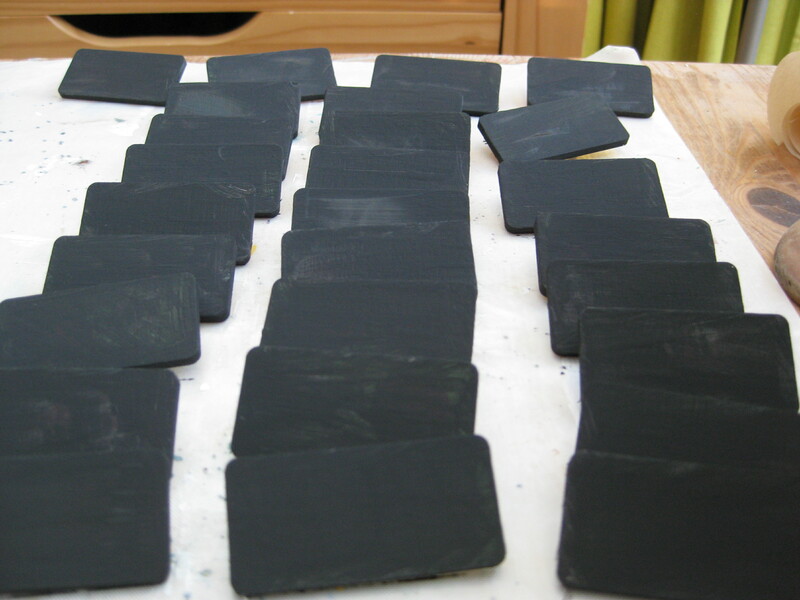 So far they are only gessoed – a bit like Ford’s original production line – any colour you like, as long as it is black. I’ve also been experimenting with DecoArt Modelling Paste, and Crackle Paste for more texture options on the mixed media day of the convention. More on that later, once it is dry and I know if it has been successful. I hope you have all booked your places – early bird discount ends tomorrow (19 February). I’m looking forward to seeing you there. Hey! Remember I told you that Suz Humphreys and I are teaching at the BADFA convention this year? Well I forgot to tell you that non-members are welcome … AND … that there is Earlybird discount for those who book before 19 February. 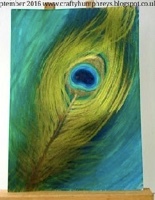 Suz will be doing her Peacock Feather on Friday morning (31 March), and a FolkIt Candle in the afternoon. 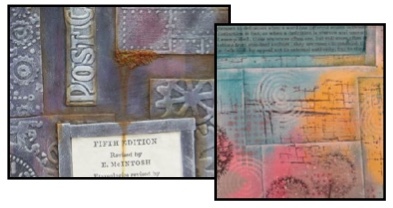 And I will be running my mixed media art journal cover all day on Saturday (1 April). Full details and booking form on the BADFA site. Get on over there and book! This year’s convention will be at Crick again. 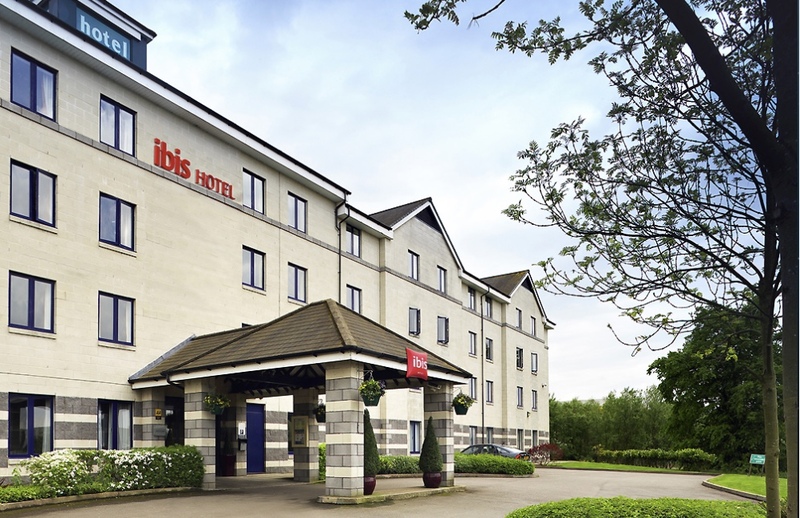 It’s a convenient location, facilities are good, and the staff cater for our every need – near enough. This year we have Peggy Harris coming from Nashville, Tennessee to do three days. 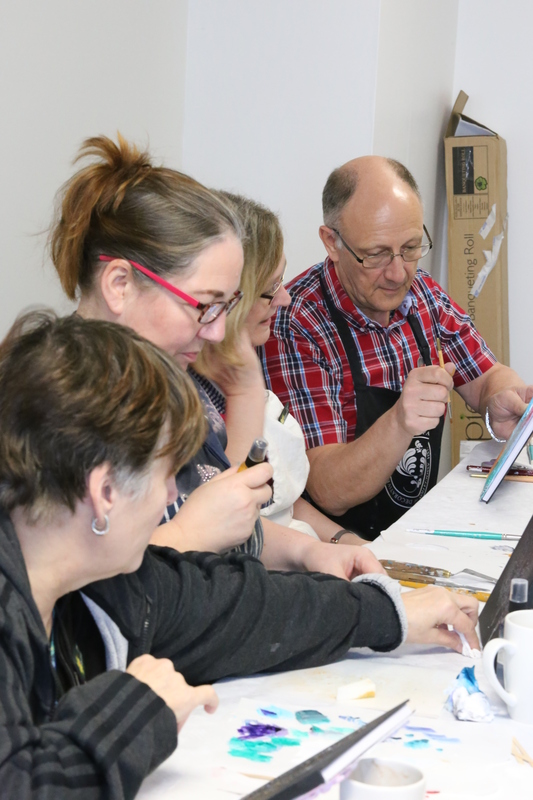 At the AGM this year, members said they’d like a range of styles and difficulties to choose from, so we have also classes offered by Suz Humphreys (Surrey Crafts), Rowena Howell (BADFA Teacher), and me. The event will run from Friday 31 March to Sunday 2 April and the format will be similar to last year’s (because it was so good, of course!). On Friday, after a day’s painting we’ll relax over dinner, then there will be an evening of … something different. 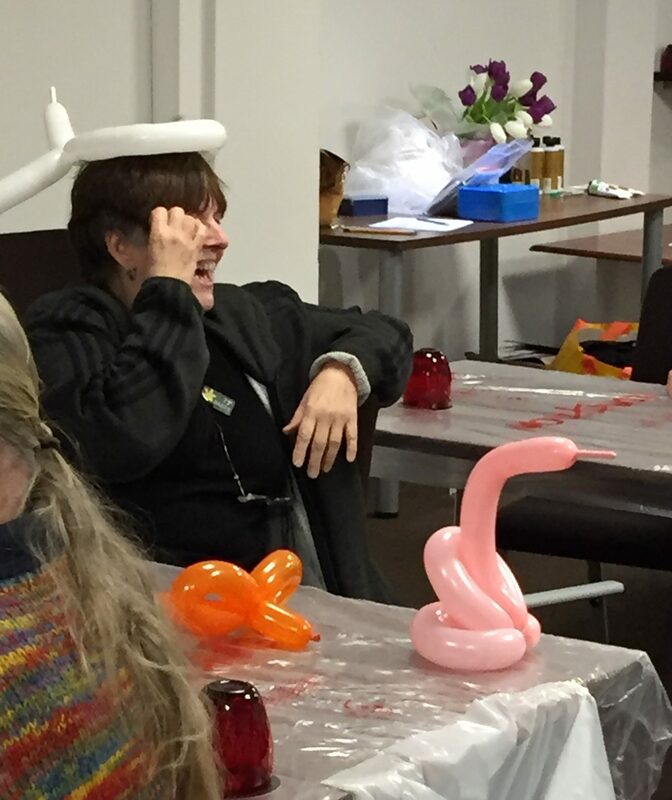 Last year we had a wine-fuelled evening of constructional competition. Who knows what will happen this year. Saturday; more painting, this time followed by the AGM, the members’ dinner, and an evening of art and experimentation – and may be wine. Sunday the last painting sessions of the weekend – then dispersal for those still standing. As a side dish, there will be traders, demos, make’n’takes, and the usual chatter. Oh, and Ann’s cake – only for the brave! I’m looking forward to it – a great way to drive out those winter blues! Will you be there? Visit the BADFA Blog for more info – and pictures!